Perth-based glazing specialist Balhousie Glazing recently joined the growing number of employee-owned businesses in Scotland, with 12 staff becoming owners. Operating throughout Perth, Dundee and beyond, the company provides a wide range of services such as windows, doors and patio installation and the building of conservatories, porches and orangeries. The team’s experience spans small residential builds and renovations to major commercial projects. We spoke with founders Malcolm Sweeney and Drew Hey, who set up Balhousie Glazing in 1993, about the decision to sell to their employees. 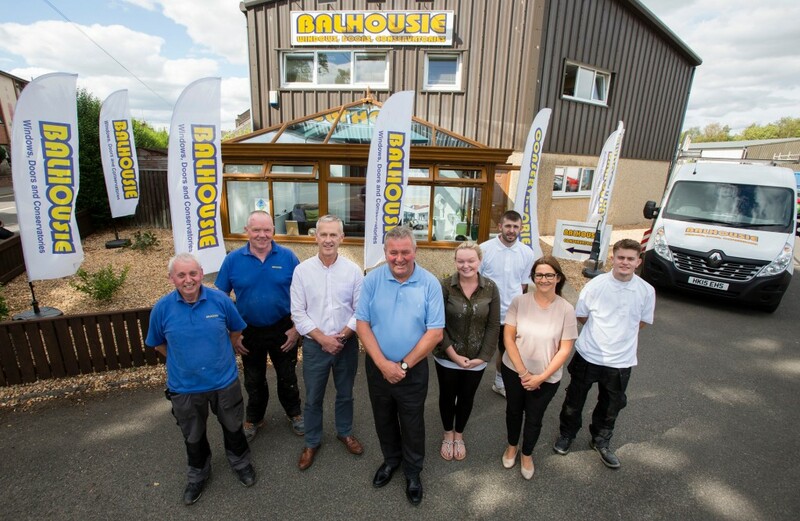 Employees and directors at Balhousie Glazing in Perth. Malcolm said: “Drew and I had been discussing the issue of succession, and as neither of us had family members in the business, the only option we were really aware of at the time was a traditional trade sale. We would likely have been purchased by a rival company, something we didn’t want. However, one day we were reading The Courier, our local paper, and spotted an article about a nearby seminar being held by Co-operative Development Scotland the following day and decided to go along. “It was about business succession and one of the speakers was Bob Anderson, financial director of Bentley’s Shopfitting, an employee-owned company based in Dundee. He spoke about how the EO process had worked for them and the benefits of employee ownership and we were really sold on it. Drew added: “We had a meeting with our employees about the decision and they seemed really happy and ready to embrace their new role as employee owners. With a vested interest in the business, they will reap the benefits of strong performance, so it’s been a positive boost for morale and motivation. This entry was posted in BLOG on August 30, 2018 by CDS Admin.